The three federal states of Mecklenburg-Western Pomerania, Schleswig-Holstein, and Lower Saxony — all of which border the North or Baltic Sea — make up northern Germany. The region includes the two major city states of Bremen (made famous by the Brothers’ Grimm fairytale, The Bremen Town Musicians) and Hamburg (the wealthiest city in Germany), which are located more inland, but are connected to the sea by the Weser and Elbe rivers. They are the two largest cities in northern Germany, followed by Hannover. With its many seaside cities, northern Germany connects the country to the rest of the world. Kiel is one of the country’s most important ports, and host of the annual Kieler Woche (Kiel Week), the largest sailing event in the world. Nearby, you’ll find the medieval cities of Lübeck and Rostock. Warnemünde is Rostock’s largest district and attracts locals and tourists alike with its long promenade and lighthouse, built in 1898. Travel an hour eastbound from Rostock and you’ll find the UNESCO world heritage city, Stralsund. This city got its name from its Gothic-style buildings and gabled houses, which give Stralsund its historic vibe. If you’re feeling energetic, climb the 104-meter-high tower of the Marienkirche — one of the three medieval churches — from which you can see the Baltic Sea, as well as Germany’s biggest island, Rügen. Rügen is Germany's biggest island. 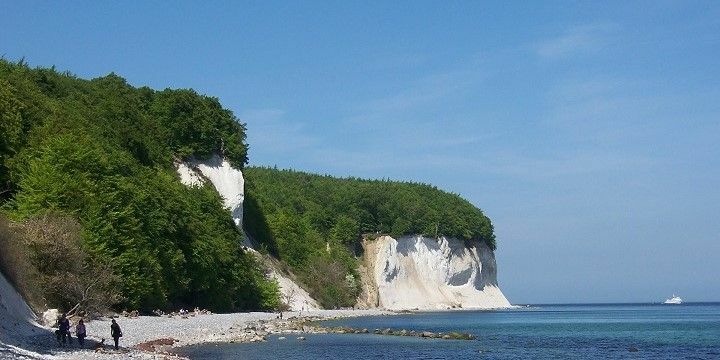 Rügen is made up of a mix of flat and hilly areas, as well as several bays, lagoons, and famous white chalk cliffs. You can reach the island by car or train over a dam from Stralsund. Other islands in the Baltic Sea that are well-worth a visit include Usedom and Fehmarn. If you’re more interested in the North Sea islands, take a trip to the Frisian Islands. Thanks to their constant cool breeze, they never get too hot; however, the lower temperatures tend to put visitors off a dip in the chilly sea. The most popular North Sea island is Sylt, also known as the haunt of the rich and famous. The island features long, sandy beaches, purple heathland, and a red fifty-meter-high red cliff, and is the perfect place to try your hand at mudflat hiking. Cars and bikes are banned from Heligoland. 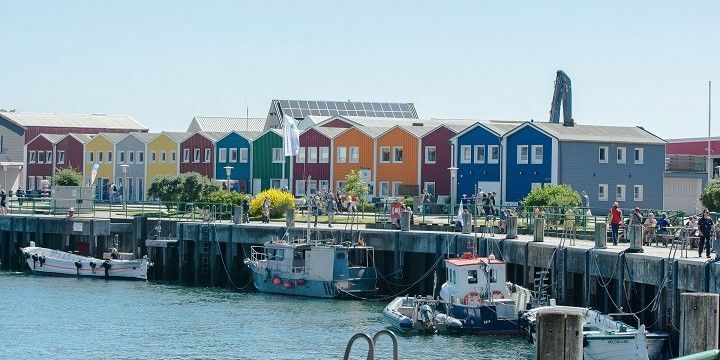 A smaller and quieter option is Heligoland, which is further from Germany’s shore. After splitting into two parts in the early 18th century, the island now consists of a mainland and the sand island of Düne, which has a surface area of just 0.7 square kilometers. A unique law states that cars and bikes are banned from this island, so if you want to explore, you’ll have to do it by foot! Back on the mainland, northern Germany’s heathland and moors offer plenty of scenic opportunities for day trips. 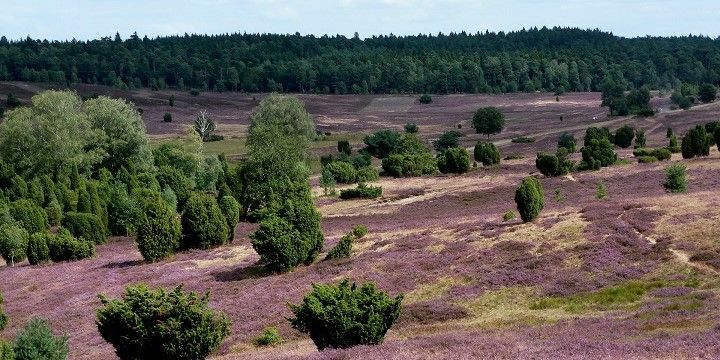 The conservation area of Lüneburger Heide, for example, is a popular recreational area year-round; however, it is at its most beautiful in late summer, when the park turns into a purple carpet of blossoming heathers. The Lüneburger Heide is a popular recreational area year-round. If you’re more of a water baby, be sure to check out the Mecklenburger Seenplatte (Mecklenburg Lake District) — which is home to 1,117 lakes — or Schwerin, the “city of seven lakes”. Here you’ll find the Schweriner Schloss (Schwerin Castle) on an island in the middle of the Schwerin Lake. Of the 2,000 plus castles and mansions in the region of Mecklenburg-Western Pomerania, Schwerin Castle is the most magnificent. If NextStop24 helped you to choose your next travel destination, we'd be very grateful if you’d search for your accommodation and things to do in northern Germany through these links. They're affiliate links, which means that we will receive a small commission for every booking made through them. There are no extra costs for you; you'll simply be helping to keep NextStop24 running. Thanks!